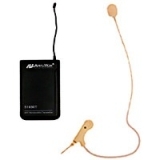 Flesh Tone single over-ear/headset electret condenser unidirectional mic with 16 Channel UHF wireless bodypack transmitter (S1690T). Frequencies: 584 - 608 MHz. Requires two "AA" batteries (included). (Replaces S1635).